Children can suffer self-esteem problems for all kinds of reasons but sport is a great way of boosting their confidence. Children’s self esteem issues should not be taken lightly, as the experiences they have at a young age can colour their opinions and personal development for the rest of their lives. So, by introducing them to sport and exercise their self-esteem will be boosted for several reasons, including body image, personal development, achievement and peer approval – none of which should be dismissed in terms of how much distress they can cause to a young mind. The issue of child obesity is everywhere – the media constantly make reference to it and our schools and supermarkets repeatedly come up with schemes and incentives to cut down on it. But by far the best way to stop your child being overweight is to involve them in sport from an early age and make sure they have a balanced diet. To be involved in sport, they do not have to be particularly good or train every day. Getting them playing a game a few times a week will be sufficient, increasing this if they want to. But as well as your child’s health, this will have a beneficial effect on their self-esteem. If they have been picked on because they are overweight or worry about their weight, there is a problem. 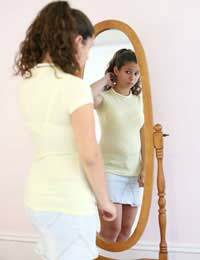 Dwelling on their body confidence issues could be disastrous and result in eating disorders. Therefore, gentle sport will help them to either get fit or stay in shape and boost their self-esteem at the same time. Children will gain in self-confidence by achieving their goals. Sport is an easy way to do this because they can have goals set for them which match what they are capable of. Therefore, if a child is not a natural runner, there is no point asking them to win a sprint raced. But if you set a goal for them to run 100m in under 25 seconds, they have something to aim for and when they reach their goal, their self-esteem will receive a huge boost. In addition, children will develop social skills and learn how to work with others. These skills will also go a fair way towards boosting their self-esteem as they make new friendships and learn their place within a team. Teamwork is a vital social skill and any child who knows the importance if teamwork will fare much better even in their early years, as others will want to work alongside them rather than against them. This issue of being accepted by other children leads to peer approval. Playing sport can lead to a huge rise in peer approval, and in turn, self esteem. This is especially important for shy children who may struggle to make friends. It is very easy for adults to say ‘just ignore them’ about other children who your son or daughter may not get along with. But these children are huge players in your children’s life. While they can never get along with everyone they meet, having some peer approval is important to children. By playing sport, youngsters will have this, either in the form of respect because they excel, respect because they try or in a binding fashion because they now share the same interests. Furthermore, sport transcends age, gender and other factors which children base friendships on so they will have a wide range of friends, all thanks to playing sport. Do not make the mistake of thinking that your child’s self esteem cannot benefit from sport unless they excel at it. This is not the case. Of course, if your child is not a natural athlete then you should not put too much pressure on them to compete but they can still gain a lot from playing sport at a suitable level with children of similar abilities.